Cutting, or pruning, coconut trees should only be done with care, and only in specific circumstances. 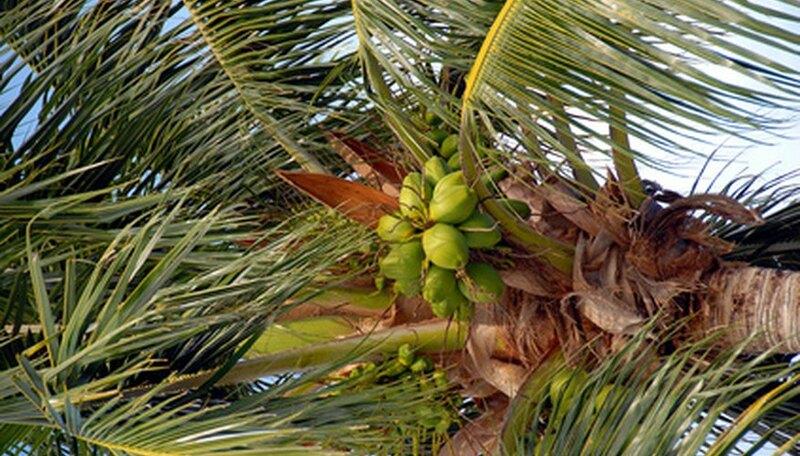 For most healthy coconut trees, pruning is not necessary and can damage or weaken the tree. Old fronds should be left to drop off on their own and not cut off. Whenever the tree has been damaged by disease or injury, such as frost killing a frond, cutting off the fronds is acceptable. Coconut trees being moved may also be pruned. Mix one part bleach with nine parts water in a bucket large enough to hold the pruning saw. Soak the pruning saw in the bleach and water mixture for at least one full minute. This will prevent the spread of any disease or fungus between trees. Identify the fronds to be cut. They should include only damaged or diseased fronds, and only those that are drooping lower than a 90-degree angle, unless you are preparing the tree for transport. If you will be transporting the tree, choose the outermost half of the fronds. Cut away the frond that is closest to the ground. Make the cut as close to the trunk of the tree as possible, without cutting or gouging the trunk. Use a gentle sawing motion, making the cut as smooth and even as you are able. Continue cutting away the fronds, removing those closest to the ground and working your way up the tree. Sanitize the pruning saw again by dipping it in the bleach mixture for at least 60 seconds before moving on to another tree. Remove any fruit while pruning by cutting it off the same way as the fronds to prevent coconuts from suddenly dropping. Don't cut off any fronds that are not drooping unless you are preparing the coconut tree for transport.